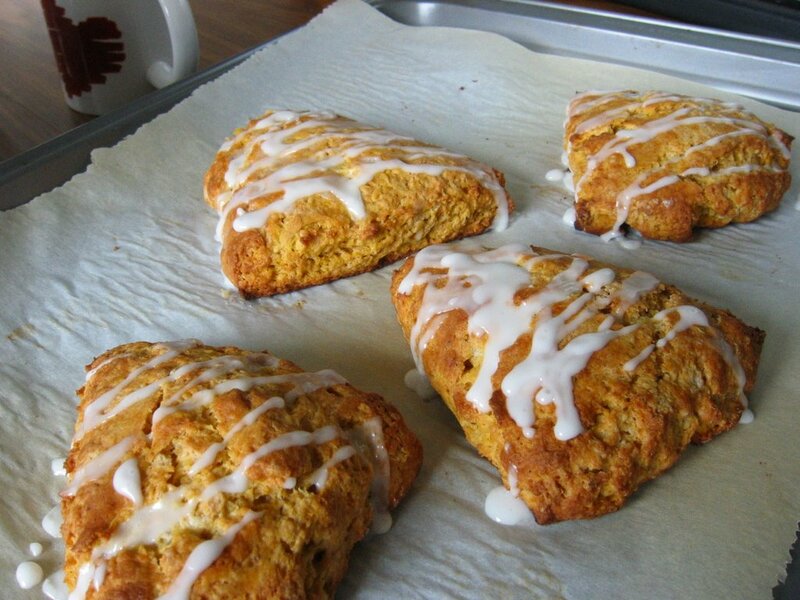 I have a copycat recipe of Starbucks Pumpkin Scones for quite sometime. Since I am not a big pumpkin fan, and have never tried the real thing before, I decided to wait until I sampled the real thing. On one lazy Tuesday morning, while waiting for my cup of coffee, I saw the pumpkin scones on the fridge display. That was my first pumpkin scone from Starbucks. It was light, with just the right touch of pumpkin flavor. Pumpkin is relatively new to me, and I find myself needing more time to get use to its flavour. Anyhow, after trying the real thing, I decided to whip up a batch on Sunday morning. And it tasted just like those from Starbucks. OCT who doesn't like pumpkin had one, and told me that he liked the texture of the scone. It has been a while ago when I first gotten this recipe, so I can't recall its origin. Preheat the oven to 425F, and combine all purpose flour, granulated sugar, baking powder salt, nutmeg, ground cloves, ground ginger together in a large mixing bowl. As the white glaze firms up, prepare spiced icing, with mixer on medium speed, mix until well combined. Drizzle this thicker icing over each scones and allow the icing to dry before serving. ( at least 1 hour)A squirt bottle works great for this, or drizzle with a whisk. Note: I find the scones having enough sweetness from the white glaze, without the spiced icing. Hence this step is omitted. I'm not sure this one's on my blog, but I've made it a time or two and never use the icing either.